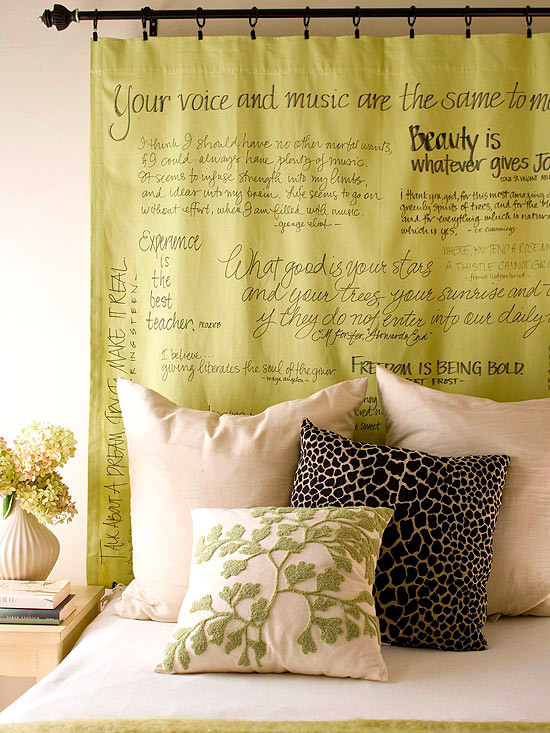 Inspired Whims: Hello, Homemade Headboards! There are few things that can really complete a bedroom suite like a headboard can. 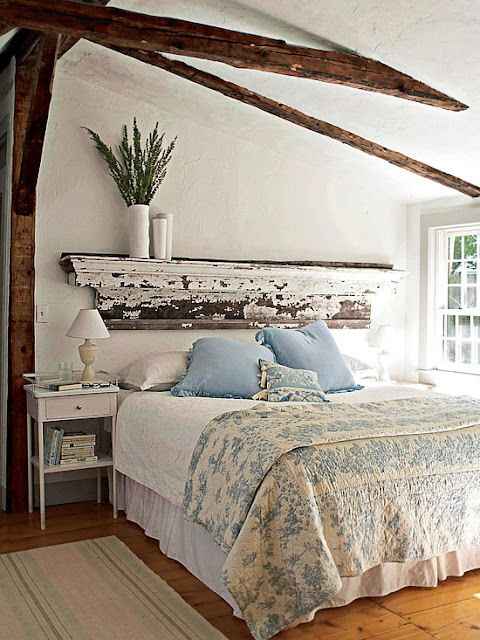 Often, the headboard ties everything together and really finishes the space. It's also something you can switch out often for a totally new spin on your bedroom - and you can do it in an affordable fashion by adopting some of these super cool ideas that I gathered from Better Homes and Gardens - Cheap & Chic Headboard Projects post and Kim's To Much Time on My Hands blog (lovin' it). Enjoy and be inspired! This one is my favorite - so I'm posting it first. The headboard is made of plywood, which has been cut into the perfect headboard shape, then wallpaperd. All you'd need is the plywood, a jigsaw, some wallpaper adhesive/glue, and the wallpaper. Bolt the finished product to the wall, and voila you're done. You could totally do this in one afternoon! Pick up 2 or 3 wall-hangings like the ones in the picture - check out Homegoods, Marshalls, Ross, Hobby Lobby, Pier 1 etc. - and simply hang them above your bed. I love the way this looks, adding so much visual interest and a little metallic pop to the space. Don't be afraid to spray paint whatever you find, to make it go with your room. That's what spray paint is for! This headboard is a stencil - totally faux and totally beautiful. If you're really handy (handier than me, that is) you can make your own stencil, or I found some great wall-decal headboards you can purchase at a cool website called Blik for around $40. You'll have to check out their website. Super cool stuff! 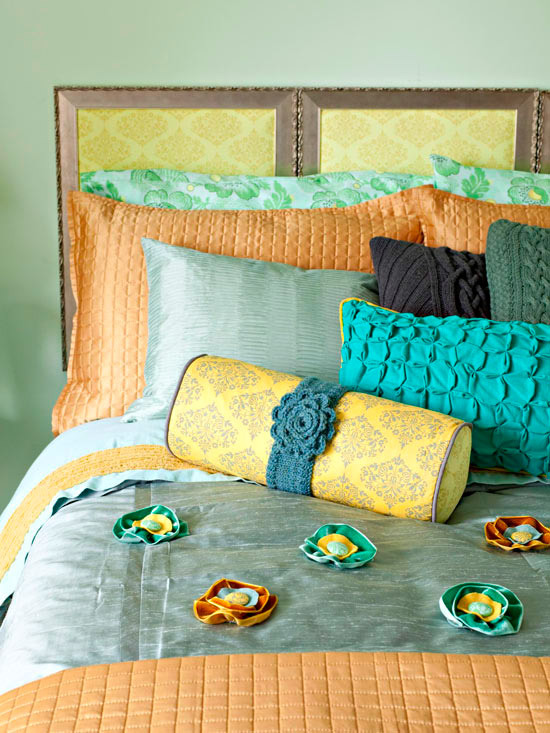 Totally do-able...this headboard is made out of large frames and some decorative paper. You could use scrapbook paper, wrapping paper, or even wallpaper in the frames. Change it out every so often to mix it up a bit. A curtain rod and a few curtain panels is a great way to frame a bed, whether you have a headboard or not. This idea also works if you have a funky shaped window behind the bed, that you'd like to take attention away from. If you use it for that, make sure you pick out curtain panels that are well-lined. This curtain panel has been personalized with some whimsical phrases...you can also use some textured or pattered panels to simplify the project. Velvet panels would be lovely, adding some richness to the space. Who knew??? 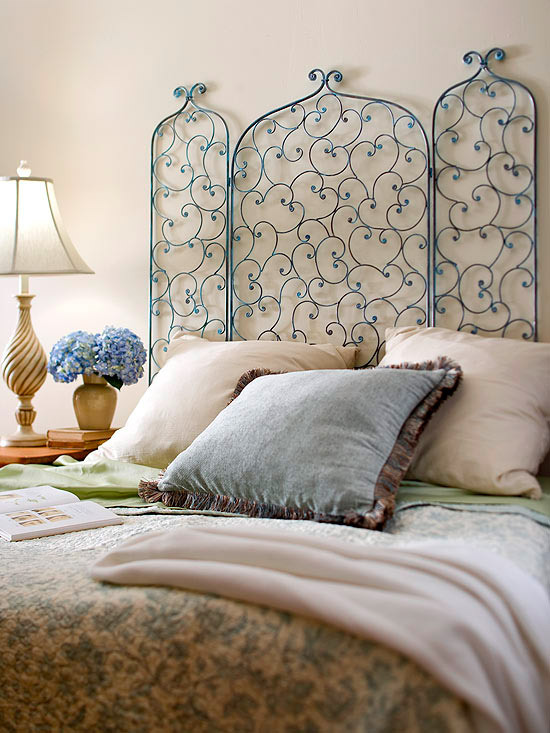 A fireplace screen, as shown above, or a room divider screen can serve as a fantastic headboard. 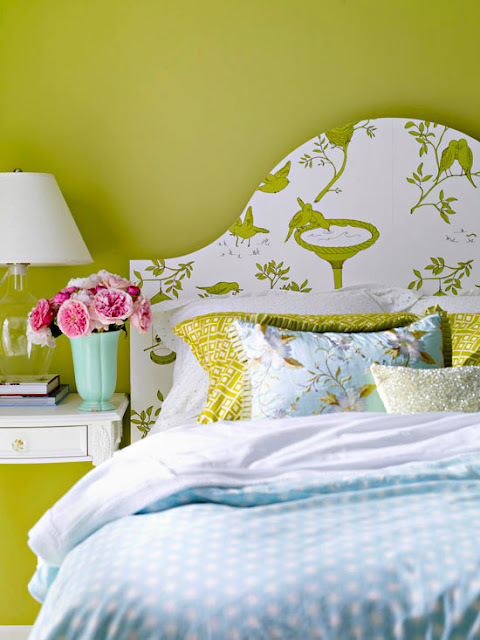 Spray paint could come in handy on this headboard idea, too...sometimes I think I should buy stock in spray paint. 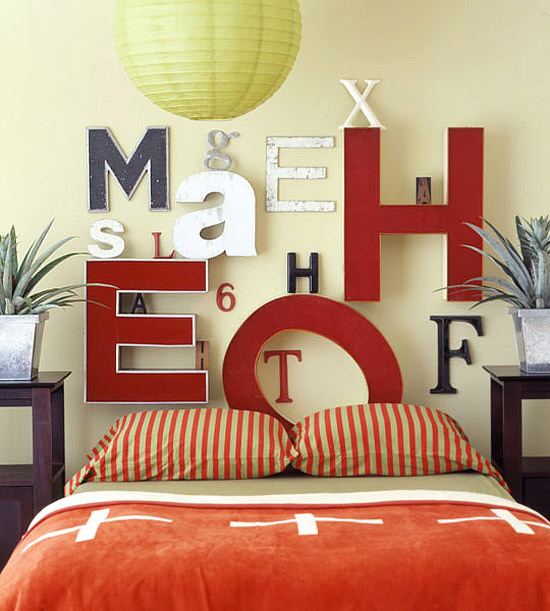 Love these letters for a more contemporary space, or even a kid's bedroom. You can find letters like these online, at craft stores, thrift stores, etc. It may take some time to collect a few but it would be a fun collection to have. 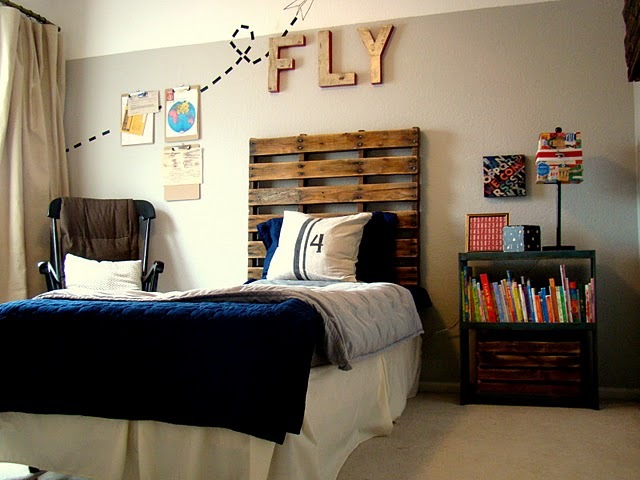 You could do something similar above a living room fireplace mantel or on the wall of a playroom. Options are limitless with letters. 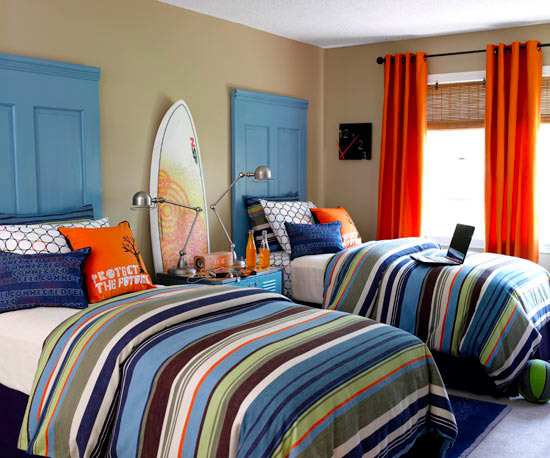 These headboards are made of doors. We found some cool vintage doors at a remnant store the other day. They were priced between $20-$100. You'd have to refinish the older doors, so if you want a paint-and-done option you could try some hollow-core doors from a hardware store or look for some options locally on Craig's list, where some builders try to get rid of extra stuff they don't use. 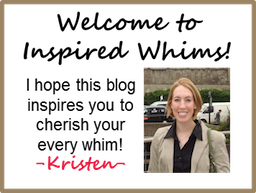 Last, but definitely not least...this headboard idea was created by the super talented Kim from the delightfully inspiring To Much Time on My Hands blog. She crafted it out of wooden pallets that she got for FREE on Craig's List. She then sanded it down very well and applied a stain/glaze and several coats of polyurethane to finish it off. You'll have to check out the details of her headboard project and more pics on her blog! if you need a practice piece, i know i need a headboard! two, actually!